JEE Main Answer Key 2018 PDF Out Now! Home News JEE Main Answer Key 2018 Out Now! JEE Main Answer Key 2018 Out Now! 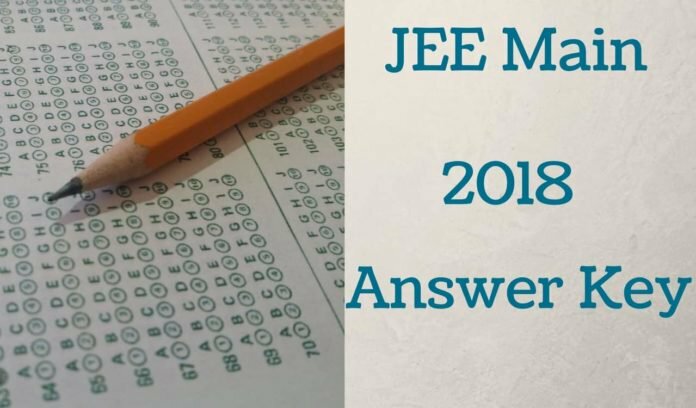 JEE Main 2018 answer key : The JEE Mains 2018 official answer keys and images of response sheets (OMR sheets) of pen & paper based examination and answer keys of Computer based examination will be displayed on the official website of the JEE Main during 24th – 27th April, 2018. The JEE answer keys 2018 will be available on the website www.jeemain.nic.in. But we are here with all the answers from some of renowned private Institutes. Candidates who have appeared for JEE Main offline exam can now download the question papers and answer keys of JEE Main 2018 here. Various leading coaching institutes like Allen Kota, Sri Chaitanya, Resonance, FITJEE, Aakash, etc. have released the JEE Main 2018 answer key. The answer key of JEE Main 2018 has been released for all four sets-Code A, B, C, D of the question papers. Knowing the JEE Main answer key 2018 will allows the candidates to calculate their approx JEE Main marks. Candidates who have appeared for the exam on April 8, 15 & 16, will be able to access JEE Main answer key 2018 PDF of Paper 1 in online mode. The answer key of JEE Main for Paper 2 will, however, be released by Central Board of Secondary Education (CBSE) online in May. Candidates who disagree with any of the answers given in JEE Main answer key can challenge the same before April 27th by submitting an application form and specified fees to CBSE along with proof of the same. The decision of CBSE will be final regarding the final answer key of JEE Main 2018. The result of JEE Main will be announced on April 30, 2018.